We live in a world that is becoming smaller every day. No the earth is not shrinking but with the continuous advances in communications and world commerce, parts and products can and are being sourced from all across the globe. Reducing cost is imperative if an organization is going to remain competitive and not only survive but also thrive. We must look for ways to do things more efficiently with less waste. We must make sure that everything we do adds value to our products or services. Lean initiatives are currently active in various industries and organizations. In order for a lean initiative to be successful, we must be able to measure and quantify improvement. Value Stream Mapping (VSM) is an indispensable tool in the Lean toolbox that can bring a new level of clarity to your processes. By mapping a process we can gain a better understanding of the work being performed, which processes or process steps are actually adding value, and which are creating waste. Value Stream Mapping is most often associated with manufacturing processes. In reality, it is currently being utilized in logistics applications, software development, office processes, healthcare and other service-related industries. No matter how large or successful an organization is, even the best of organizations can become more efficient and more effective. When we go to work each day and make our way through the facility, looking at the same processes and workstations we gradually gain a certain perspective. We tend to miss things because we may have become blind to possible waste or opportunities for improvement. Sometimes we need a different perspective. By using Value Stream Mapping, we can gain a different perspective of our facility and the flow of material, people, product and information through the facility. Value Stream Mapping is kind of like looking at your facility and process and flow from several hundred feet above – it is a method of getting the bigger picture. When you consider the process above, it is actually a circle because once the future state map is implemented it becomes the current state map. In the future, you may begin the cycle again. This explanation will concentrate on the creation of the Current State Map. When creating a Current State Value Stream Map, it is vital that you document what is actually happening in the process. At this point, we are not concerned with how the process is supposed to work. We are not trying to create a perfect state map, but simply a map that depicts reality. Later we can examine it and look for methods to improve. For now, we want just the facts. Before we can begin construction of a Value Stream Map, we need to cover the symbols used. Value Stream Mapping utilizes a set of symbols or icons that depict the activities, workstations or process operations, along with the material and the information flowing through the process. There are multiple variations available for use depending upon your application. It is also beneficial to calculate your Takt time for comparison to the actual process time once the VSM is complete. Calculate Takt time by dividing the net available production time by the customer demand. The Takt time is the rate at which the customer actually demands product. Work your way through the process identifying the flow of materials first. Document each of the process steps, adding all the process boxes, data boxes and completing all the data. The data boxes generally contain information regarding number of operators, machines, cycle times, etc. Next, identify the inventory and any waiting times. These are the triangles with an “I” in the middle. To document the inventory, count the number of parts between the processes and note them under each of the triangles. In some cases, you may want to convert the inventory numbers into days’ supply. Simply divide the number of pieces by the average daily demand. In addition to the material flow value, Value Stream Maps also include the flow of information through the entire process. At this time, you should add the production control box to the map. It is common to have multiple information streams within the process. There are two basic types of information flow identified within the VSM. A straight line represents manually distributed information and a line resembling a lightning bolt represents electronic information. While completing the VSM, include both types of information and how they flow between the various departments and processes. Furthermore, it is good practice to identify what information is being utilized. This could include information from the suppliers to the facility, order information from the customer, as well as production planning information and shop level work orders. Next, add the timeline to the bottom of the Value Stream Map. The timeline allows us to separate the value added cycle times recorded in the data boxes from any non-value added time (Inventory time). The final step in development of the VSM is to add all the “value-added” cycle times together and enter the sum in the box at the end of the timeline. In the same manner, add all of the “non-value-added” times together and enter the sum in the box at the end of the timeline. You can then calculate your Process Cycle Efficiency (PCE). This is calculated by dividing the value-added time by the Production Lead-Time (PLT). Inventory time is equivalent to PLT. 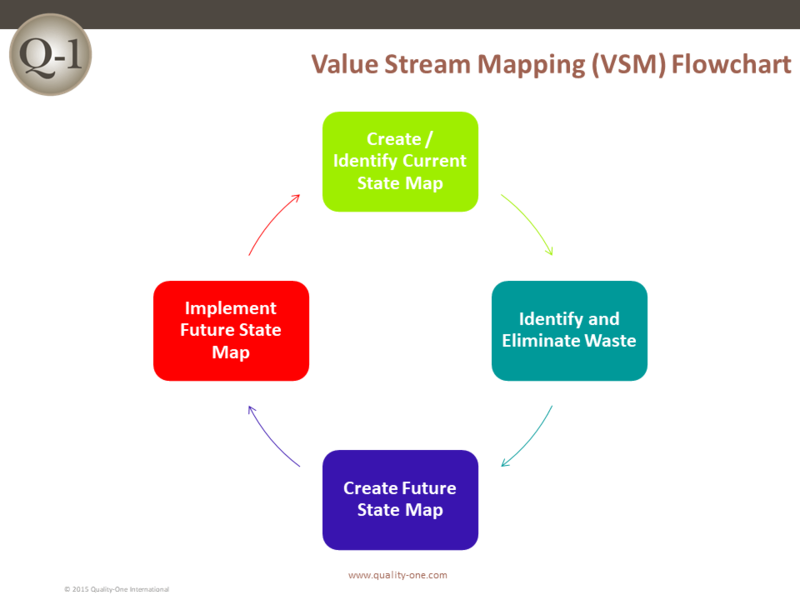 Once you have completed the Current State Map you have only taken the first large step in the VSM process. Next, you should analyze the Current State Map and identify waste and opportunities for improvement of the process. Review the material and information flow, what process steps are required and how much inventory is sitting in WIP awaiting the next process. In addition, examine the method and types of information flowing through the process. Then determine the actual customer demand for the product and calculate the Takt time. If you are not meeting demand, determine how the process can be improved and then make it happen. The benefit of Value Stream Mapping is to look at the entire picture for opportunities. Use that new perspective to develop the Future State Value Stream Map and plan improvements. Then follow through and ensure the changes happen. Once all the identified improvements are complete, the Future State Map will become the current State Map and the process can begin again. Remember, the path to continuous improvement is not a straight line but a circle. 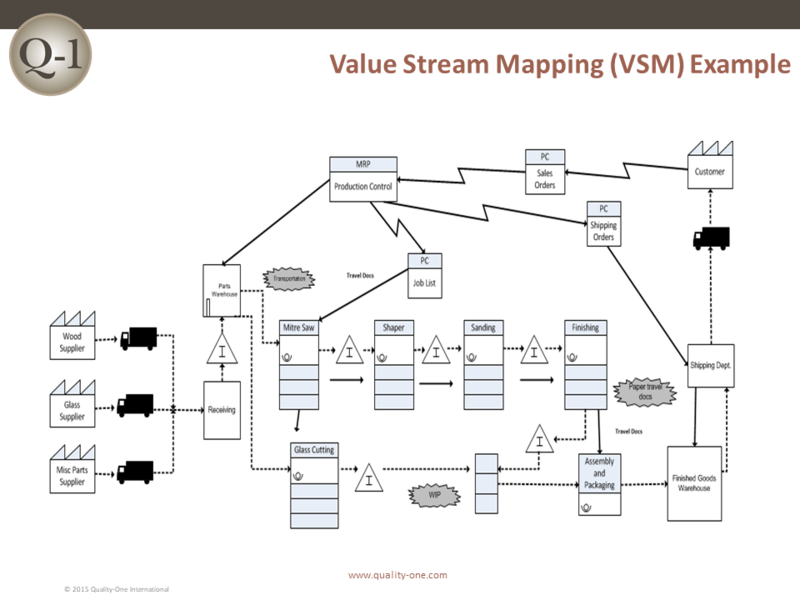 At Quality-One, we can help you understand and achieve the benefits of Value Stream Mapping. Our experienced team of Subject Matter Experts (SME) can develop a tailored approach for developing your people and processes based on your unique needs. Whether you’re interested in Value Stream Mapping Consulting to assist in planning and implementation, Value Stream Mapping Training to bring your team up to speed Value Stream Mapping Support to help you drive process improvement using VSM or other Lean practices, we can provide the help you need, enabling you to accomplish your continuous improvement goals. At Quality-One, your success is our business! Quality-One offers Quality and Reliability Support for Product and Process Development through Consulting, Training and Project Support. Quality-One provides Knowledge, Guidance and Direction in Quality and Reliability activities, tailored to your unique wants, needs and desires. Let us help you Discover the Value of VSM Consulting, VSM Training or VSM Project Support.